This rug is beautiful! We have it in our dining room and I love the rustic look/feel of it. 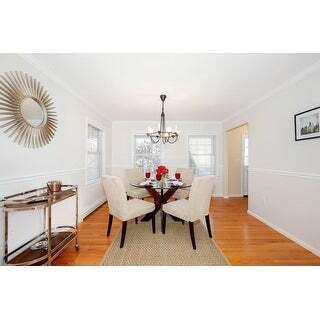 It goes so well with our decor and the you can't beat the price. Safavieh rugs are some of our favorites because you get a high-quality rug for such an affordable price. So happy we bought it! 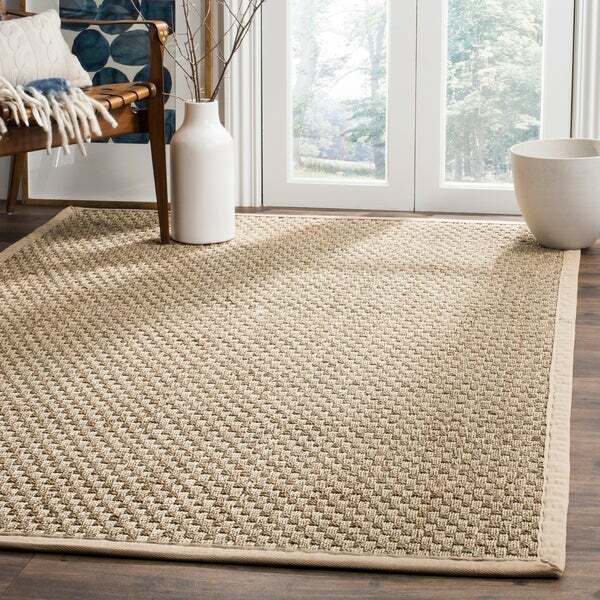 Turn any living space into a stylish beach home with the organic beauty of this 5' x 8' seagrass rug from Safavieh's Natural Fiber Collection. Bordered in beige cotton twill, this rug's clean, neutral pigments and elegant basketweave design allow for unlimited decorating versatility. I was concerned it would be green as others reviewed and rolled up it did have a green hue. However, it was very minor and fades because this is seagrass. I ordered in 3 sizes to accommodate an open floor plan and help it flow. Wish we could add pictures, all three rooms are different in their own way but beautiful with this rug because it goes with any decor. The weave is tight enough that dining chairs easily slide in and out without damaging the weave. The border is light and although it seemed to get dirty fast I found that wiping with a dry cloth knocked off most of the dirt. We do have a dog and had a party after adding the rugs...they still look great. I did order two 4x2.5 rugs to lay over a high traffic corner and also where my husband occasionally looses a drop of coffee. I got the same pattern and border and take them up when we have a party. I did this because originally we had Overstocks Cozy Shag Rug which hides everything, is very forgiving and yet we wore out one corner after really heavy use on one corner. In two rooms I added smaller rugs (5x8 over 9x12 and 3x5 over 5x8) to layer over these to add dimension and texture. Love this look in magazines and it really increased the cozy factor. Definitely recommend this rug!! I also liked the subtle chevron pattern but it wasn't available in all sizes I needed. I saw one in person and it subtle enough that it will bear the test of time. Our local carpet store custom makes these and it would have been $400 more had I gone through them. Using my O Rewards, taking advantage of an Overstock sale weekend I really saved. I also called Overstock since it was my birthday month and although they don't have a birthday promo program he offered 10% off which was nice but less than the 12% they already had going. Customer service also helped me find a bulk purchase coupon. Gotta love Overstock!! C'mon Overstock....let us add pictures! You could sell more rugs if others like the layering effect. I was happy to receive my new Safavieh Natural Fiber Seagrass Rug ahead of schedule even during the busy holiday season. It has a beautiful classic modern look, so I placed it on the floor just inside the front door. Several guests complemented its eye catching beauty but it was no match for the claws of our pet (Whippet) dog. She is very well behaved but runs back and forth to the door any time someone knocks. Unfortunately, her nails catch in the weave pattern of the seagrass rug and now it has several noticeable snags. So Beware, Beautiful but not pet friendly. This the second time I have ordered this Safavieh Natural Fiber Seagrass Rug -- the first one I ordered was 9 X 12 as a gift to my brother. I like it so very very much that I decided to order one for me. I needed the smaller size because I wanted to use it in my Great Room in front of the sofa with the coffee table underneath. I placed over my wall-to-wall carpeting and there was no need for a pad. I am quite certain that due to the durable construction of this rug that it will last a very long time. I am very very pleased with the quality and price of this item and recommend it highly. This rug is described as beige and looked lighter on my computer than it appears in person. It looks more like a taupe. Even though the color is darker than I had hoped, I still like the color well enough to keep the rug. It smells a little like new mown hay but the smell is going away gradually. I imagine that the smell is not unusual for a natural fiber rug. All in all, I like it a lot and I think it brings a beachy feel to the room. As others have commented, it's not great on bare feet, but that isn't a problem for me because I don't go barefoot. I am glad that I made this purchase. I love these safavieh seagrass rugs. no complaints. great prices. beige border can show dirt but can clean it easily. Very pleased with this seagrass rug. Color is great and the quality seems good. good natural color and texture!!! I am very pleased with this sisal - i have purchased in 5 x8, 8x10 and small for kitchen -would highly recommend. Great price - it is a true natural fiber - I use it under kitchen and dining room table - so, not worried about it being rough on feet. The rug is so durable. The border adds a nice touch. Looks great with my coastal decor. I highly recommend this rug for a high traffic area. You will not see any dirt. Wonderful rug. Very pretty rug. I bought two for my porch. Loved them! They say they are indoor outdoor rugs......WRONG. Both are molding and only had them down for a month. Very upset. I just ordered some different ones and these are going to the dump. We have this rug in several sizes. I not only love the coastal casual feel they add to our room, but also they have held up very well over time. Super easy to clean and still a soft feel on bare feet after almost two years. Highly recommend! Very happy with this. Gives a really neutral high end look. Doesn’t need a pad. Goes with just about any staging decor I Come up with. have used suv Successfully in million dollar listings! Great price for a sisal rug of this size. Was delivered on time and with only minor imperfections in the weave. The color is perfect too. Highly recommend if you need a natural weave rug in a high traffic area for a great price! Was not sure what to expect when I bought this rug but I could not be happier. The color is neutral and can go anywhere. I have it in my living room which is a combination of sea and Fenton Art Glass and it works perfectly and is very easy to vacuum. It was another exceptional deal from Overstock. 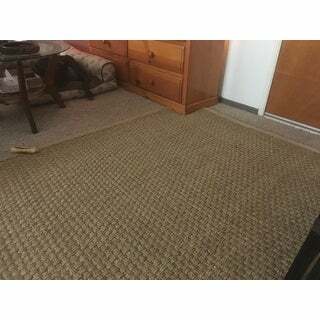 This seagrass rug has held up quite well in a very high traffic area with dogs and kids. It is easy to vacuum and is soft enough to walk on. This rug is a solid outstanding rug for a house with kids. It’s rugged enough but also classy enough for any decor. Using for under my dinning room table and really makes the table pop!! This rug met my expectations 100% and the price is great. Thank you. I love the way this rug looks, and it gives me a nice foot massage as I walk across! I have only had it one week but seems to hold up to human and pet (one dog) traffic. One star deducted because it was about 5 inches short of 5 feet wide. What a mess. This should be only used outside. Everytime we walk on it, pieces scatter all over and out into the other room. I will be returning this. Otherwise, its very pretty. Just messy. Nice for porch. Would reccomend. "Can this rug be used outside on a patio with some sun?" "Would this be usable over carpet? Have a spot in front of sofa that is so badly stained that I’d like to place a rug over it. Any ideas?" No, I would not use this rug to hide the badly stained carpet because of it is coarse fibers and can be harsh on your bare feet. I do have my seagrass rug over my carpet it added a bright touch to my living room. Very well made, I also have a smaller size in my kitchen it brings the two rooms together nicely. Great buy. "how good is this rug in a kitchen under a table"
We ordered more than one of these and have found that they hold up well in areas of high traffic; also in a kitchen seating area. Under a table seems least likely to provide and problems since it would only receive minimal wear. I think so! I have it under my dining room table and have not had much issue with staining. The rug is high quality and durable! Not to mention very nice looking! Personally I feel it is a little thicker than I would use for under a kitchen table and chairs. It holds up well, but, the weave sits higher than I would want in that area. "Some of the fibers become unwoven and stick out. What is the best way to fix this?" Same here. I just use my finger and push them back in/down. "What type of backing does the rug have? I am putting it on hardwood floor do I need a pad underneath it?" Yes, it needs a pad. I don't recommend it for indoors--it is very rough underfoot and has a somewhat unfinished look. I originally bought it to go in a bedroom, but, upon seeing it, decided to use it on the front porch instead. It is very nice as an outdoor rug! I agree with all the foregoing (needs a pad, is rough underfoot) but in fact use it in a foyer of a fairly formal home. The interplay among the smooth and shiny hardwood floors and the oriental rugs in rooms visible from the foyer, to my eye, provids interesting contrast and I like the texture. I've had it for about a year, it is vacuumed regularly and seems to be holding up well. It definitely needs a backing. I agree with all of the previous respondents to your question, in that you may not want to put it indoors. This is not something you would want a baby to crawl across or for anyone to experience barefooted. Also it's thicker than it appears in the photos. I returned mine. "can this rug be effectively cleaned with a vaccuum or must it be shaken. its going under a large kitchen table so shaking isnt really an option....anyone have vaccuum feedback?" Yes I vacuum my rug.It is in my bedroom so it gets vacuum ed often. I have this rug in our enclosed front porch, and I vacuum it pretty regularly without any problems. I only have one "catch" in the fibers, but that was a result of something other than the vacuum, so I just tucked it back in, glued it down, and it has stayed put even with repeated cleaning. Nice rug to maintain. Yes it can be vacuumed. I adjust the pile height on the vacuum cleaner or shut off the roller as if on floor setting to be gentler on the natural fibers. "Can this rug be vacuumed? " We do vacuum it but it's used at a lake house that is seasonal.